Tython Squadron is a Battleteam formed from the members of House Satele Shan of Clan Odan-Urr. The unit was founded in 35 ABY. Currently, the squadron is undergoing extensive flight training to achieve operational accreditation and final commissioning. The squadron’s official mission is to aid in the defense of the Kiast System as a subordinate unit under the operational control of JTF Satele Shan. Unofficially, Tython Squadron’s true purpose is to serve as the internal security apparatus within Clan Odan-Urr, tasked with combating corruption, sedition, and infiltration from within the Clan’s ranks. The genesis of Tython Squadron began with the destruction of New Tython during the Eleventh Great Jedi War. Odan-Urr’s failure to stop the calamity and protect the Harakoan race shook the organization to its core. The need for a dedicated defense force to ensure the same fate does not befall the denizens of the Kiast System became acute due to the unexpected victory over the forces of The Collective in the Twelfth Great Jedi War. With new recruits, prosperity, and prestige the secrecy and security of Odan-Urr’s territory has never faced greater peril. Director Maximus Alvinius and Executor Len Iode approached Lieutenant Colonel Mauro Wynter clandestinely in a series of meetings within the Sky Breach Base to discuss the formation of the squadron. Major Silvia Tanos, Intelligence Officer of the Remembrance of Seher, was assigned as the military liaison and helped Wynter hand pick the pilots of Tython Squadron. Nearly all were veterans of the destruction of New Tython. Upon the initial formation many new pilots flocked to join Tython Squadron to the point where many lesser pilots transferred to flight crew and field operatives of the nascent internal security arm of the Battleteam. Needing to run the unit through operational trials, Mauro Wynter and Silvia Tanos engaged the Basic Flight Training slate of events. The pilots underwent countless training missions and simulations. During one such training mission the squadron caught a smuggling vessel, the Raxanna's Remorse. This C-ROC Cruiser was moving advanced weaponry within the Kiast System and sending coded messages to the Iron Throne and hidden operatives within Sky Breach Base. The cruiser, due to impressive flying by all parties, was captured and returned to Daleem. For their conspicuous gallantry Chrome, Junazee, and Ranarr Kul-Tarentae were awarded the title of Aces by Maximus Alvinius. The team next frantically began investigating the data gathered from the "Raxanna's Remorse" and other fragmented intelligence. This presented an opportunity for Tython Squadron to test out their abilities as field operatives and keenly perform counterintelligence and internal security screening on the personnel assigned to Sky Breach Base and JTF Satele Shan as a whole. During the so called Operation Enigma, Tython Squadron spent extensive time and efforts tracking down insider threats. Key evidence implicated a young officer known as Ensign Yon Keto. Keto was receiving large sums of funding from off-system and dispersing it widely in small increments - pay offs - to accomplices and subverting the junior officer corps within the JTF. Sadly, he was killed before more intelligence could be gained. His death was kept a well guarded secret for only those with top secret clearance and vetted by Tython Squadron members personally. Due to their conspicuous gallantry, Korroth, Arcia Cortel, and Ethan Martes earned their Tython Ace stripes. However, evidence pointed towards a clandestine mercenary group operating under the aegis of the Iron Throne and other large industrial conglomerates within the Kiast System and the Arx System. Tython Squadron triangulated communications stemming from the Unknown Regions, and was contacted by members of Battleteam Nighthawk of Clan Arcona. The team rapidly mobilized an expeditionary force for advanced scouting and reconnaissance. This would turn out to be Tython Squadron's first mission outside of Kiast and its baptism of fire. This heavily classified event, later known as the Rendezvous of Destiny, saw the pilots of Tython Squadron launch a coordinated strike with the assistance from the Maurader-class frigate Nighthawk and several flights of Arconan piloted X-Wings against a flotilla of ancient fighters, support vessels, and a rearmed Nebulon-B frigate, the Defiant-II. Seer Constantine was given operational control of the Tython fighter-craft, under the tactical guidance of Mar Sûl, while Mauro Wynter and a strike team of Jedi and military personnel landed on the Defiant-II flight deck. Fighting their way from the flight deck, Mauro tasked Arcia and Chrome to lock down the ship's propulsion system as the Jedi made their way to commandeer the bridge. Finding little resistance, a trap was sprung by a cunning Grand Inquisitor known as Taril Hron and a small cadre of lethal IG-100 Magna-Guards. While Junazee held the Inquisitor at bay, Knights Tyraal Bitshiver and Zeline Nemesis fought the deadly droids. Wynter was able to retrieve data from the bridge implicating the Shipwrights' Guild and the Inquisitorius in the rampant number of ships going missing in the Kiast System and of a plot to overthrow the Empress of the Vatali Empire. During the heat of battle, Wynter distracted Hron and Junazee dispatched her, eliminating the threat. 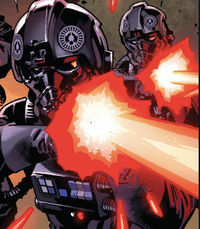 Calling in their reinforcements, the joint forces of Tython Squadron and Nighthawk were able to force the remaining crew to surrender and take the Defiant-II back to the Kiast System as a war prize, with barely enough time to brief Director Alvinius and Executor Iode on the ongoing threat to the Odanite forces. For their exemplary dedication to duty during this engagement Korroth, Talis DeMorte, and Ethan Martes were commended as Tython Aces. The intelligence gathered from the Defiant-II implicated rogue elements of the Inquisitorious working in league with the Shipwrights’ Guild to overthrow the Vitali Empire. Tython Squadron mobilized teams to infiltrate the Shipwrights’ Guild sprawling territories on Daleem while flights were stationed in orbit prowling the skies on alert. The infiltration teams found themselves ambushed in the streets while the pilots were jammed in the skies above. A coordinated assault by the Maelstrom Corsairs, now a known front for the Shipwrights’ Guild, saw Tython Squadron scattered to the wind and fighting for survival. Korroth, Junazee, and Mauro Wynter fought their way out of the streets of Daleem and reached Sky Breach Base, but sadly Major Silvia Tanos died heroically protecting her team against a high ranking Inquisitor. The battered remnants of the infiltration teams were reunited with Chrome, Ethan, Zeline, and Sia who defended the base and coordinated the teams’ response. Above Daleem the Maelstrom Corsairs fleet arrived, and headed straight for Sky Breach Base’s orbital platform. The Defiant-II and the Tython flights made up of Aaleeshah, Tyraal, Talis, Jafits, Mar Sul, and Kasula Daegella fought a desperate delaying action to give time for OEF capital craft to respond. Things were equally bleak planet side, as the JTF Shan ground forces were deployed to protect the Imperial Gardens and thwart a Corsair move to seize the Vitali seat of power on Daleem. All appeared lost as landing craft began to converge on The Foundry, the Shipwrights’ Guild main industrial complex, discharging thousands of assault forces. However, the timely arrival of Arcia on the Remembrance of Seher gave the few remaining friendly forces a brief respite that was direly needed. As the Corsair fleet surged forward to finish off the rag-tag flotilla, their flagship was isolated. Taking the initiative, Len Iode sprung the trap perfectly and arrived in a newly acquired Vindicator-class Heavy Cruiser, the Resolve. Caught in a pincer movement, the Maelstrom Corsairs were annihilated and the enemy ground forces loyal to the Shipwrights’ Guild were isolated and contained. Tython Squadron had held, but at the loss of many new pilots wounded in action and removed from flight status, and the death of their Adjutant, Major Silvia Tanos. Tython Squadron’s training craft were based in hangar Delta Seven of the Sky Breach Base orbital platform. The squadron secretly renovated the defunct Garza's Pathfinders Central Cloister within the planet-side of Sky Breach Base as their operations center and intelligence gathering nexus. These accommodations were temporary in nature; upon commissioning the squadron was looking for a home of their own and the determination of which fighter craft they would be piloting. The squadron trained on captured Collective Quadjumper spoils of war. Upon commissioning Tython Squadron found itself needing operational fighter-craft capable of a diverse mission set. Funding through conventional military procurement proved to be problematic due to the covert status of the team, and hostility from the OEF. In light of these concerns, Tython Squadron was granted the contraband contents of the Raxanna's Remorse, an elite TIE Defender squadron. The OEF reluctantly assigned a skeleton crew of mechanics and ground crew to support the unit. 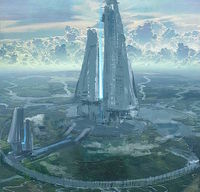 In light of the secrecy required by the Battleteam, Maximus Alvinius and Len Iode granted Tython Squadron temporary control of the orbital platform of Sky Breach Base. The TIE Defenders are still housed within hangar Delta Seven and the remainder of the platform is being renovated to provide better orbital defense, command and control, and security features along with other classified amenities. After the events of Operation Enigma, Mauro Wynter used his personal credits and the squadron's mechanics to convert the seized Raxanna's Remorse. Rechristened as the Hegemon, this vessel is the primary support craft for Tython Squadron. In this capacity the vessel serves as a carrier for auxiliary fighter craft, a MEDEVAC platform, and a strike team infiltration/exfiltration delivery device. Raider Chrome (x2) - "Chrome"
Knight Ethan Martes (x2) - "Ulwan"
Colonel Arcia Cortel - "Admiral"
Mystic Talis DeMorte - "Warpath"
Tython Aces are more than an honorific, they are the only pilots who retain their flight status indefinitely. Until pilots earn this title they must continually requalify to stay in the unit based on activity and participation in official missions. Also, as a mark of honor, Tython Aces are entitled to a specific call-sign to register their fighter-craft and to be designated within the organization. While a new unit, Tython Squadron has already had several notable pilots within its ranks. Some have transferred, but played an integral part in the unit's successes. Lieutenant Colonel Mauro Wynter - Founding member, unit plank-owner, and first Commanding Officer of Tython Squadron. Vanguard Ranarr Kul - Tython Ace, unit plank-owner. Transferred to serve as Clan Rollmaster. Major Silvia Tanos - OEF military liaison officer, intelligence officer of the Remembrance of Seher. Silvia served as Squadron Adjutant, and was an honorary unit plank-owner. KIA during the events of The Shadow of the Kesaret. Within three weeks of the unit's formation, Tython Squadron had grown to 18 pilots - the largest BT within the DJB. The first unit event, Basic Flight Training received over 54 entries for 5 competitions, comprising an 85% participation rate. The second unit event, Operation Enigma received over 28 entries for 3 competitions, comprising a 90% participation rate. The third unit event, Rendezvous of Destiny was historic due to being one of the few inter-Clan Battleteam events, receiving over 47 entries for 4 competitions, comprising an 80% participation rate. This page was last modified on 8 March 2018, at 19:19.